Hello there, welcome to NOMADasaurus, Australia’s biggest adventure travel blog run by the award-winning travel writers and photographers Alesha Bradford and Jarryd Salem. They’re going to stop talking about themselves in the third person now. Hi! Thanks so much for swinging by our little corner of the internet. We’re so stoked that you found our site and want to know a bit more about us. So grab your favourite drink, pull up a chair and let us fill you in on just what the hell we are about. That probably is the most obvious question, isn’t it? We started this website at the end of 2013 as a way to document our overland journey from Asia to Africa without flying. A few years later and this is now one of the most popular adventure travel blogs on the internet, and we have to admit we’re pretty proud of that! We never thought this site would grow into what it is now, with the blog being our full-time jobs and over 200’000 social media followers from around the world all checking in to see what’s happening as we travel non-stop. In fact we didn’t even want to start a travel blog in the beginning! We’d already been on the road for 5 years when we started our overland journey, and it was only because so many of our friends told us to make one that we did. Read about the evolution of NOMADasaurus here. This site has changed a bit over the last few years. Today we specialise in adventure travel, sustainable tourism, overland journeys, off the beaten path destinations, photography and creating travel as a lifestyle. We document these experiences with a journalistic style of writing, coupled with captivating photography. Recently we’ve opened up NOMADasaurus to new writers and have a great team behind us bringing out amazing content. Us hanging out in Tulum, Mexico back in 2012. Or maybe it was 2011? Ah, I get it now. So who the hell are you then? Thanks for asking! Well, as you already know we are Alesha and Jarryd, otherwise known as Lesh and Jazza. We are an Australian couple who have been travelling the world together since 2008. But before that, we both were solo travellers, with Lesh exploring Australia, New Zealand, the UK, the US and Canada, and Jazza hanging out in the US, Fiji and Canada being a ski bum and full time partier. 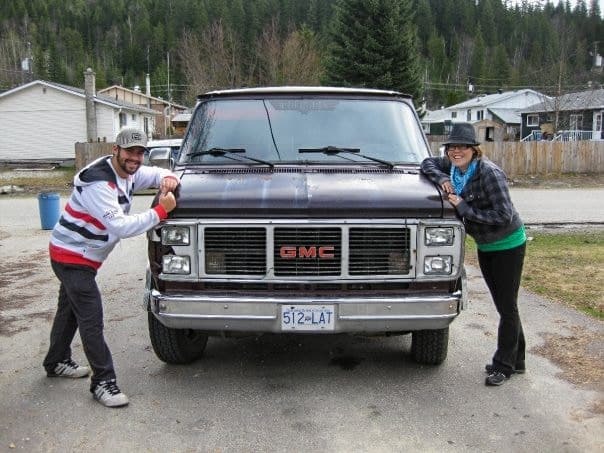 We met in a hostel in Vancouver in the sweet summer of ’08, then spent the next few years travelling 40’000km around Canada and living in our awesome van, Latoya. It was during this time that we fell in love with overland travel, and in particularly road trips, and some of the happiest days of our lives were spent being dirt poor, eating crackers and sleeping inside of our van. Not wanting to stop travelling, we made plans to drive Latoya to Alaska in 2011. However fate had other plans for us. Just 3 weeks before starting our next big road trip Latoya decided that she couldn’t be bothered driving anymore and broke down in Southern BC. In a fit of spontaneity, we sold Latoya to a friend and bought one way tickets to Guatemala. Central America became our new home over the following year as we bounced around from place to place, hanging out, learning Spanish and studying the Mayan culture. We managed to fit in a whole bunch of fun adventures, from scuba diving in Mexico’s cenotes to trekking to El Mirador. Us and Latoya, our home and transport across Canada. At some point we found ourselves crewing on a catamaran and learning to sail as well. A freak storm off the coast of Nicaragua forced us to abandon that dream and we set back off onto land. 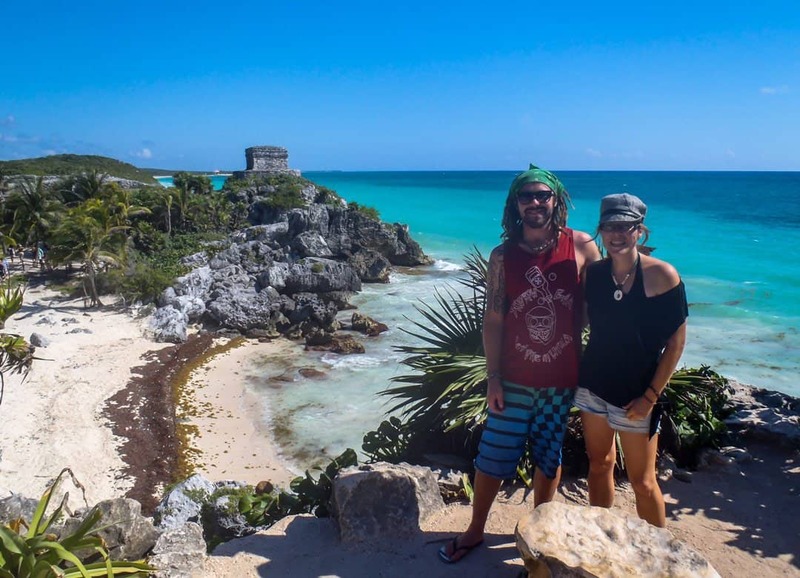 When we weren’t breaking world records with friends, having wheelchair races, slacklining in Mayan temples and hitchhiking between remote villages, we could be found eating mangoes, sleeping in hammocks on the beach and smoking cigars in Cuba. On a bus in Mexico one day Alesha told me that she wanted to go to Africa, so we started making plans to backpack around the continent. Later that night we started drinking some cervezas and the idea kept growing, until we finally settled on travelling from Cape Town to Thailand without taking a single flight. We returned to Australia, bought another campervan to live in and started saving some money to fund the next dream. At the last minute we flipped the trip in reverse, bought a one-way ticket to Phuket and started wandering. We bought motorbikes in Laos, rode 15’000km around Southeast Asia, got engaged inside the biggest cave in the world, finally moved into China after 14 months, hitchhiked and caught buses for four months to Mongolia, travelled across to Central Asia, road tripped along the border of Afghanistan, crossed the Caspian Sea on a cargo ship and somehow ended up in Istanbul, two years after we landed in Phuket. 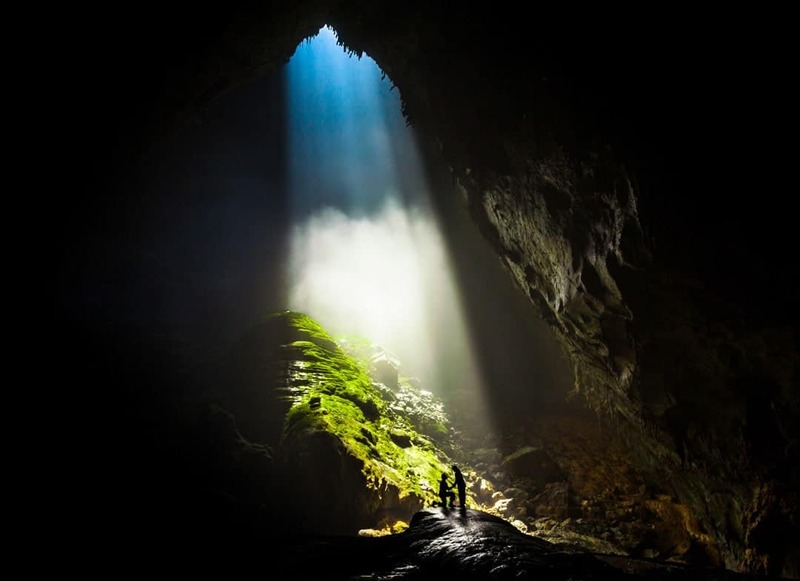 Our engagement photo from inside Hang Son Doong, the largest cave in the world! At this point, everything changed for us. We were exhausted and had no energy to tackle Africa after our mammoth mission across Asia with no flights. Our blog had turned into a business, we wrote an article about spending some time apart (that subsequently went viral), we broke our no flying rule and ended up back in Thailand, thinking that a break there would do us good. Naturally we got bored after 3 weeks, booked one-way tickets to Europe and spent the summer of 2016 hanging out there. After much thought we decided to fly home, get married and do some soul searching. We ended up back in Thailand, and now for the first time in three years, we stayed in one place for more than 19 days. At the beginning of 2017 we flew to South America, went on a 11-day expedition to Antarctica, took a quick trip to mark hiking trails in Kyrgyzstan, but otherwise travelled by land continuously in South America until it was time to head to the Galapagos Islands. We headed to Ireland to speak at a conference, road tripped around in another campervan and then found ourselves wandering around Iran for a month. At the end of the year we flew to Australia and were challenged by Volvo to race some yachts across the country, by land. It was time for a bit of a break, so we spent the first 6 months of 2018 based in Sydney, Australia (with a cheeky 5-week campervan and adventure trip to New Zealand thrown in of course). Afterwards we flew back to Central Asia to run the first ever NOMADasaurus PhotoVenture tours to Kyrgyzstan! They were a huge success, and we are stoked to have pulled it off. Before we knew it we were road tripping around Canada on a campaign with the national tourism board. Fun (and thousands of photos) ensued, then we headed down south for another epic work trip to South Georgia in the subantarctic. Afterwards we backpacked around Peru and Bolivia, flew to Canada for a week of snowboarding then returned home. The dream of overlanding through Africa is still strong, but we’ve decided to pick it back up in the future when we’re ready to hit the continent properly. And that’s about it for our little travelling lives. It’s been a lot of fun, it’s been tough at times, but we couldn’t be happier with how things have panned out. Cheers for reading this far! We hope that gives you a bit more of an idea about who we are and what this site is about. Hope to cross paths with you on the road! We’re always down for a drink and to talk travel! Want to learn more about this website and how to make your life an adventure? Note: In 2014 Jazza was announced as the winner of the World Nomads Travel Writing Scholarship. Even though he was awarded with a writing course from a Lonely Planet author, an all-expenses-paid trip to Europe and opportunities to become a freelance travel writer with some of the biggest names in the industry, he was not given a surfboard.